So Shay: Cankles and couches. I'm here today because I woke up with the strangest pain. I have back pain pretty much all the time (thank you ta ta's) and I've become accustomed to it. However, this morning when I woke up, I had the strangest, most painful feeling and it still has yet to go away. My ankles are killing me. They hurt sooooo stinkin' bad. It almost feels like I got up in the middle of the night and jumped off the roof of my house. They hurt that bad. Now, I don't have cankles and I don't judge if you do happen to have them. 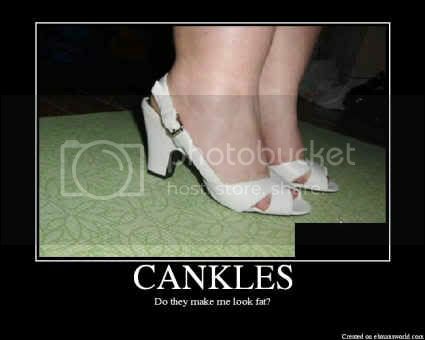 I'm serious, there is nothing wrong with cankles. I have friends who have them and they rock them out like it's going out of business. However, I don't know what the heck happened in my sleep last night to make them hurt so freakin' bad. Probably not. This is just super strange. In not so weird news...GUESS WHAT!? This girl is getting her new couches delivered today! Yeah, they weren't my first or second choice. But hubs really liked them because they were GIGANTIC in the store. Um...which means that they will be even bigger in our house. I'm just a tad bit nervous. We have no room to walk but on the couches. Maybe that will be good for my ankles? 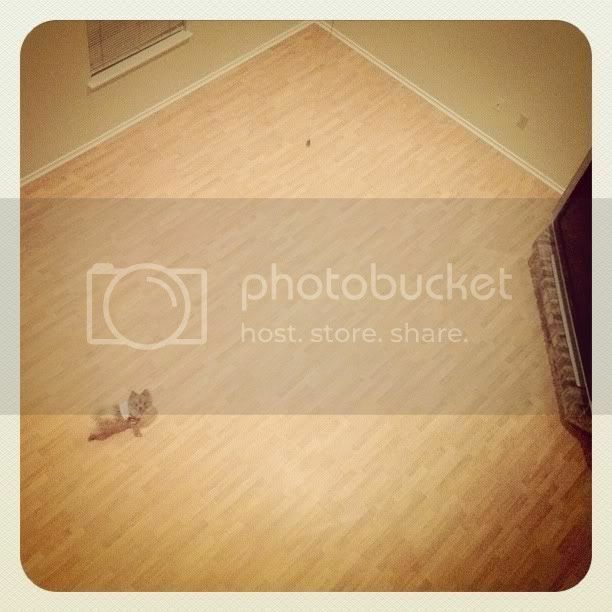 Last night we spent the evening cleaning out our living room. We moved it all. I found my old iphone case in the bottom of my couch too. SCORE. I swear that thing up and disappeared on me. 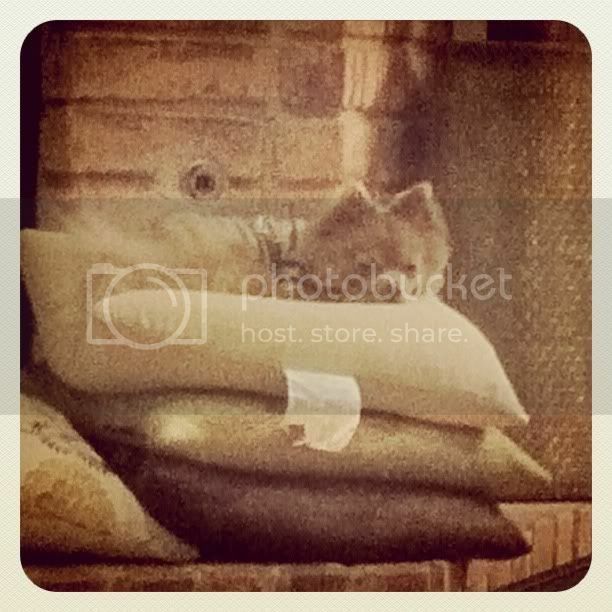 But no, poor little fella was just chillaxin' at the bottom of my couch. "MOM! I'm drowning in this sea of laminate floors! HELP!" Little Furlee down there has no idea. We are having a garage sell tomorrow. I'm a little nervous as everyone in my office says they come in huge groups and train their kids to steal. Good news though...we mostly have BIG stuff. Muahahhaw. SUCKAS! Welp. Happy Friday my lovely little friends. This girl will be rolling around on her big fat couch this weekend and getting up early for a garage sell. It is my first...and will probably be my last. P.s.) 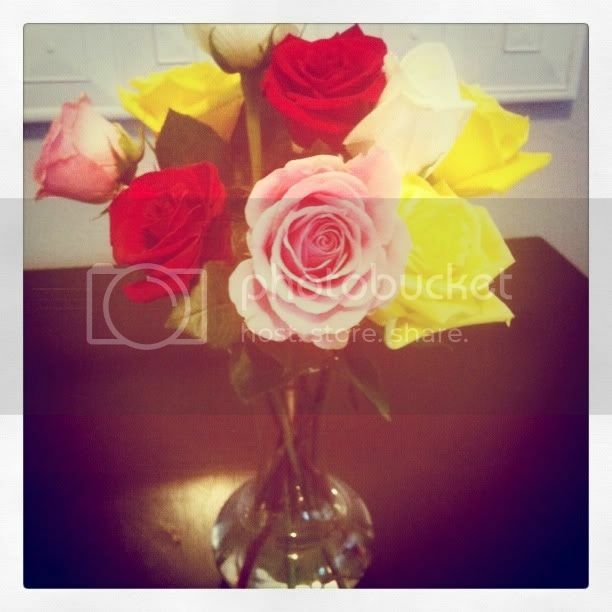 Hubs got me these pretty little roses this week. Such a thoughtful man I have. Funny thing is...he said, "Now babe...These are ONLY for you as long as you don't go posting them on facebook." Now babe...they are still for me right? You didn't say I couldn't blog about them. YAY for new furniture!! :) Good luck on the garage sale! i hope your ankles feel better! you could have slept in a way that gave you a cramp...ive slept weird where my knees feel like im an 80 year old woman but it was from the way i slept! OUCCHH! Hope your ankles feel better soon! Good luck on the garage sale. & can't wait to see the couches. Have a great weekend relaxing!! I hope your ankles feel better! That's so weird! Have a great weekend! Enjoy the couch and the garage sale! I think men and women just don't agree on couches. My fiance hates the couches we have that I brought with me when I moved in. His were leather and so uncomfortable, and you couldn't sleep on them. And in the grand scheme of life, aren't afternoon naps on the couch one of the greatest pleasures? hope your ankles are feeling better! hope you enjoyed your new couches all weekend!